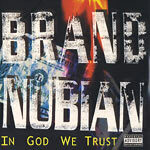 With Grand Puba's departure shortly after the issue of the group's debut full-length, Brand Nubian as a trio was no more. Grand Puba went on as a solo artist while Lord Jamar and Sadat X (formerly Derek) kept the Brand Nubian name and released the amazing follow up In God We Trust. The album quickly silenced anyone who had any doubt that they would be able to follow up their debut classic with another classic as they did just that. ''Allah U Akbar'' starts things off and was a clear sign that they were back in business in a very real way. Songs like ''Pass the Gat'' and ''Steady Bootlegging'' show the no nonsense style that had come to be expected from the Nubians, while ''Love Me or Leave Me Alone'' surprised all with how perfectly they blended the subject matter of woman and relationships, without it being corny. ''Black Star Line'', ''The Travel Jam'' and ''Ain't No Mystery'' all round out the album and are a perfect mix of cutting edge production and the five percent subject matter the group is known to espouse. The albums classic single, the Diamond D produced ''Punks Jump Up to Get Beat Down'' was the cut that truly lit a fire under hip hop's collective rear-end. The album version of the song went hard but the remix utilized in the music video?confirmed that THIS Brand Nubian were here to stay.